What do you want in a dress shoe? Will you be wearing that dress shoe to social events or to work every day? You need to answer a few questions ahead of purchasing a new pair of shoes as it is going to affect the shoes you buy. Today we are going to be reviewing the Bruno Men's Classic Modern Oxford Wingtip Lace Dress Shoes, very popular dress shoes that you can buy online. It is our goal to see if these shoes should be bought by looking at the durability of the shoes, the overall look of the shoes and if they are comfortable to wear for long periods of time. The Bruno Men’s Classic Modern Oxford Wingtip Lace Dress Shoes come with a lot of features to enhance your look and keep you comfortable throughout the day. What drew us to these shoes in the first place is their incredibly affordable price. They are not going to break the bank but will offer you a pair of men’s classic dress shoes that are reasonably priced. 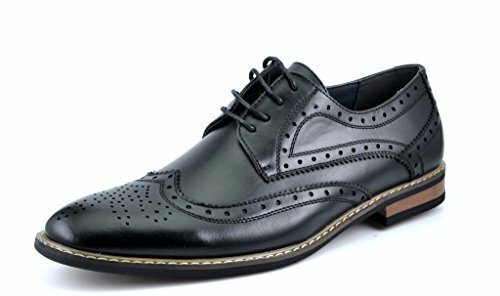 What separates the Bruno Men’s Classic Modern Oxford Wingtip Lace Dress Shoes from other models on the market, is there are many colors to choose from. They come in black, brown, dark brown, and multiple shades of black and grey. There are over six colors to choose from through Amazon, and that is going to give you a new level of customization when it comes to purchasing dress shoes. The heels on these shoes measure just 1” off the ground, giving you a bit more height without being so high that they are uncomfortable. The shoes have been made with a lightly cushioned man-made footbed. The heel is made out of wood so it produces that wonderful sound while walking around the office. These men’s wingtip shoes will complement any professional look that you may want. They have a non-skid outsole, so it will not mar your floors. Purchasing any article of clothing, especially a brand new pair of shoes, comes down to a matter of personal preference. You need to know what you want ahead of time, and what your style is before you make a final purchase. Even though we may praise one pair of dress shoes, they may not be the right ones for you. No matter what we say, we encourage you to keep on with your research and try some on at the store in person. Also, if you are buying online, which we recommend as it can be the cheapest way to buy shoes, just make sure there is either a refund or an exchange policy in place. You want to be sure that if the shoes arrive and do not fit, you can still return them and get the proper size in their place. We have seen horror stories of people being stuck with a pair of shoes that do not fit, so double check before buying. With that being said, we believe the Bruno Men’s Classic Modern Oxford Wingtip Lace Dress Shoes is an okay pair of shoes if you want to go cheap. Because of their price point, they are more cheaply made, but that does not mean they are terrible. What we enjoyed most about them is that you can choose from a multitude of colors. They do look incredible at first and are very classy. The one thing we did notice is that they are not ventilated well at all, and your feet feel a little bit stuffy inside. When they arrived, they also had a bad smell to them. 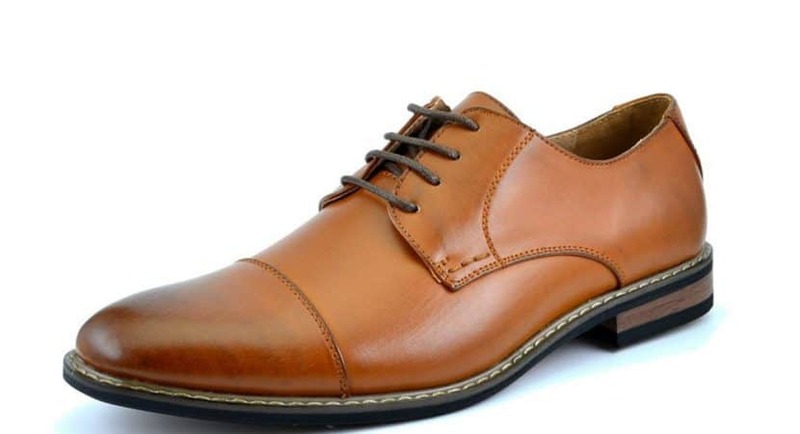 If you are looking for a great looking pair of shoes, and do not mind that they are not the most durable made but are affordable, the Bruno Men's Classic Modern Oxford Wingtip Lace Dress Shoes may be the best ones for you.